Gladstone developed rapidly with the arrival of the railway in 1877. When Port Pirie became the main Spencer Gulf Port, the railway was built to transport grain from the fast expanding agricultural areas to the east. Subsequently the narrow gauge (3′6″) was extended through Jamestown to Peterborough, and north from Gladstone to Wilmington. This also allowed out of town students to attend Gladstone High School, albeit for only a few hours, as the railway timetables were not compatible with school hours. The last narrow gauge to be closed was the line to Wilmington in 1982. Broad gauge (5′3″) was laid from Hamley Bridge to Gladstone in 1927 to allow goods to be transported from Adelaide. Transhipping then became necessary to shift goods from the broad gauge to the narrow gauge wagons. Passenger trains to and from Adelaide were also introduced. 1969 saw the standard gauge (4′81/2″) completed. Gladstone, Port Pirie & Peterborough all had the three (3) gauges, but Gladstone was unique in that no other railway satation yard had the three (3) gauges interlaid together within the one area (siding). Progressively facilities were withdrawn, buildings dismantled and rail lines and point systems were removed, with the railway station being officially closed in 1991. Today various trains still use the standard gauge line, but the largest use is for the transportation of lead and zinc from Broken Hill to Port Pirie. Over 80 train movements are witnessed through Gladstone SA in any week, with between 10 and 15 freight trains daily depending on the day of the week. This can make for interesting train spotting. Freight consists of ore, grain. steel, intermodals, trailer rail freight and mineral sands, with the privately owned company SCT also using the line for intermodal transport. 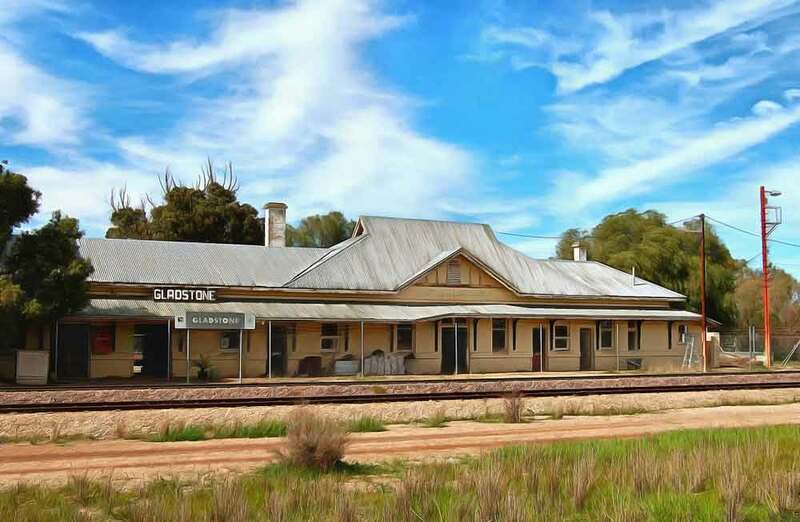 A number of other trains travel through Gladstone on an ad hoc basis such as ballast trains, heavy track maintenance equipment, the Track Diagnostic Train and the occasional movement of single locomotives. The world famous ‘Indian Pacific’ train currently passes through 2 times per week (Tuesday and Thursday). When you next visit Gladstone, allow some time to view the interpretive signs displayed in ‘Three Gauge Park’ which tell more of the involvement in the railway journey.